حاجی میرزاعلیان, فاطمه, حاتمی, محمدرضا, ملکی, وحید. (1397). تعیین سازوکار کانونی زمین‌لرزه‌ها با بزرگی 5≤ Mn ≤ 2 در منطقه البرز با استفاده از قطبش اولین رسید موج P و نسبت دامنه موج S به دامنه موج P. مجله ژئوفیزیک ایران, 12(3), 122-144. فاطمه حاجی میرزاعلیان; محمدرضا حاتمی; وحید ملکی. "تعیین سازوکار کانونی زمین‌لرزه‌ها با بزرگی 5≤ Mn ≤ 2 در منطقه البرز با استفاده از قطبش اولین رسید موج P و نسبت دامنه موج S به دامنه موج P". مجله ژئوفیزیک ایران, 12, 3, 1397, 122-144. حاجی میرزاعلیان, فاطمه, حاتمی, محمدرضا, ملکی, وحید. (1397). 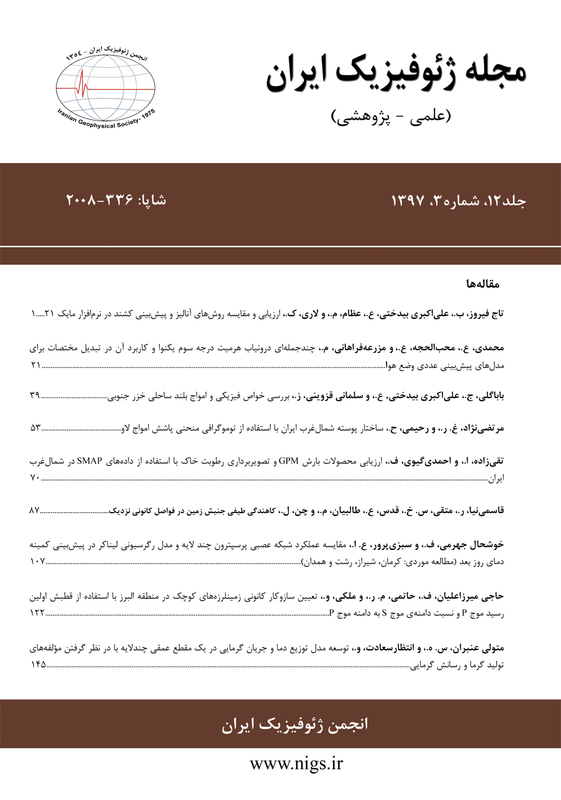 'تعیین سازوکار کانونی زمین‌لرزه‌ها با بزرگی 5≤ Mn ≤ 2 در منطقه البرز با استفاده از قطبش اولین رسید موج P و نسبت دامنه موج S به دامنه موج P', مجله ژئوفیزیک ایران, 12(3), pp. 122-144. حاجی میرزاعلیان, فاطمه, حاتمی, محمدرضا, ملکی, وحید. تعیین سازوکار کانونی زمین‌لرزه‌ها با بزرگی 5≤ Mn ≤ 2 در منطقه البرز با استفاده از قطبش اولین رسید موج P و نسبت دامنه موج S به دامنه موج P. مجله ژئوفیزیک ایران, 1397; 12(3): 122-144. با اندازه‌گیری سازوکار کانونی زمین‌لرزه‌ها می‌توان جهت انتشار گسیختگی، ساختار گسل و میدان تنش منطقه را تعیین کرد. در دسترس بودن حجم وسیعی از زمین‌لرزه‌های کوچک، استفاده از آنها را برای این منظور حائز اهمیت کرده است. هدف این مطالعه، تعیین سازوکار کانونی 4204 زمین‌لرزه با بزرگای 5≤ Mn ≤ 2 ثبت شده در چهل‌و‌یک ایستگاه از ایستگاه‌های شبکه‌های لرزه‌نگاری مرکز لرزه‌نگاری کشوری در منطقه البرز با استفاده از قطبش اولین رسید موج P و نسبت دامنه موج S به دامنه موج P است. این زمین‌لرزه­ها از سال 1997 تا ماه مه سال 2015 رخ داده‌اند. در این تحقیق از شکل‌موج‌های گیرنده‌های سه مؤلفه‌ای استفاده شده است. شکل‌موج‌های سرعت با انتگرال‌گیری، به شکل‌موج‌های جابه‌جایی تبدیل شدند. به‌دلیل ضعیف بودن کیفیت شکل‌موج‌های زمین‌لرزه‌های کوچک، کاتالوگی از سازوکار کانونی 277 زمین‌لرزه با بزرگای Mn بیشتر از 5/3، بر‌اساس زوایای امتداد، شیب و لغزش فراهم شد. به‌منظور بررسی عملکرد این روش در تعیین سازوکار گسلش در منطقه موردنظر، دوازده زمین‌لرزه مصنوعی نیز تولید شد که نتایج بررسی آنها ارائه خواهد شد. گسلش غالب در نواحی شمالی منطقه موردمطالعه، معکوس و در نواحی جنوبی امتداد‌لغز است. در امتداد باختری گسل طالقان، اکثر سازوکارها امتداد‌لغز چپگرد تعیین شده‌اند. راستای گسل ایندس، شمال‌باختری‌- جنوب‌خاوری است و در امتداد جنوب‌خاوری آن با توجه به سازوکارهای رویداد 18/6/2007 و تعدادی از پس‌لرزه‌های آن، گسلش منطقه معکوس است. نتایج این مطالعه با بیشتر نتایج مطالعات قبلی در این منطقه هماهنگی دارد. Calculating the focal mechanism of earthquakes, helps us to investigate the direction of rupture propagation, the style of faulting, stress field and the seismicity potential of an area. Focal mechanisms classically are determined by using the polarity of P- wave first motion. This method depends on the number of P wave polarities per event and the data set dispersion distribution Significant improvement of long period instruments caused advantages in using waveform inversion method for determining focal mechanism of earthquakes. In this method outspread outlier data can be used. Extensive availability of small earthquakes makes them useful in determining focal mechanisms. The current study accomplished to determine focal mechanisms of 4204 events with magnitude 2≤ Mn ≤5. The earthquakes were recorded in 41 stations of Iranian Seismological Center (IRSC) in the Alborz region. The focal mechanisms were prepared by using the polarity of P wave first motion and S/P amplitude ratios. In this study, waveforms of three-component seismograms were filtered with bandpass filter in a 0/1–10 Hz frequency range. Seismograms with velocity components were integrated to the corresponding displacement components. P-wave first motion polarities are revised by reviewing the waveforms carefully. For calculating the S/P ratios, P wave, S wave and background noise amplitudes were measured by selecting 2 second time windows from waveforms. Maximum amount of S/P ratio is near the nodal planes and the minimum amount is far from the nodal planes. Using P wave polarities and ratios, the final focal mechanisms were obtained. With the progressive improvement of IRSC networks since 2012, more P wave first motion polarities can be recorded and the number of the calculated S/P ratios for each event has increased. In this study, data set of 1997 to May 2015 was investigated. Because of weak qualities of small earthquakes waveforms, small events were omitted and a focal mechanism catalogue containd strike, dip and rake angels for earthquakes with Mn greater than 3.5 was produced. The method also was tested with 12 synthetic earthquakes in the Alborz rigion. Most of the focal mechanisms at north of the region have thrust-faulting components and at south they are strike-slip. Along the left side of the Talaghan fault, most of the focal mechanisms are left-lateral strike-slip which shows the left-lateral motion along the Mosha fault. The Indes fault has north west-south east strike. Along the south east side of this fault, the focal mechanisms of 18/6/2007 event and its aftershocks show the inverse faulting. The results of this study are compatible with most of the previous studies in this region. ملکی، و.، شمالی، ظ. ح.، حاتمی، م. ر.، 1391، بررسی مکان‌یابی زمین‌لرزه‌های محلی به روش غیرخطی و کاربرد آن در تعیین محل زمین‌لرزه‌هایی با بزرگی 0/4 ≤ Mnدر ناحیه البرز مرکزی (2006-2010 ): مجله فیزیک زمین و فضا، 38(4)، 23-37. Alavi, M., 1996, Tectonostratigraphic synthesis and structural style of the Alborz Mountain system in northern Iran: Journal of Geodynamics, 21(1), 1-33. Allen, M. B., Ghassemi, M. R., Shahrabi, M., and Qorashi, M., 2003, Accommodation of late Cenozoic oblique shortening in the Alborz range, northern Iran: Journal of structural Geology, 25(5), 659-672. Ashtari, M., Hatzfeld, D., and Kamalian, N., 2005, Microseismicity in the region of Tehran: Tectonophysics, 395(3-4), 193–20. Axen, G. J., Lam, P. J., Grove, M., Stockli, D. F., and Hassanzadeh, J., 2001, Exhumation of the west central Alborz mountains, Iran, Caspian subsidence, and collision-related tectonics: Geology, 29(6), 559–562. Berberian, M., 1983, The southern Caspian: a compressional depression floored by a trapped, modified oceanic crust: Canadian Journal of Earth Sciences, 20, 163-183. Berberian, F., and Berberian, M., 1981, Tectono-plutonic episodes in Iran, in Gupta, H. K., and Delany, F. M., eds., Zagros–Hindu Kush–Himalaya geodynamic evolution: Geodynamics Series: Washington, D.C., American Geophysical Union, 3, 5–32. Berberian, M., and Yeats, R. S., 1999, Patterns of historical rupture in the Iranian Plateau: Bulletin of the Seismological Society of America, 89(1), 120-139. Davoudzadeh, M., Lammerer, B., and Weber-Diefenbach, K., 1997, Paleogeography, stratigraphy, and tectonics of the Tertiary of Iran: NeuesJahrbuch fur Geologie und Palaontologie-Abhandlungen, 205, 33–67. Djamour, Y., Vernant, P., Bayer, R., Nankali, H. R., Ritz, J. F., Hinderer, J., Hatam, Y., Luck, B., Le Moigne, N., Sedighi, M., and Khorami, F., 2010, GPS and gravity constraints on continental deformation in the Alborz mountain range, Iran: Geophysical Journal International, 183(3), 1287-1301. Ebel, J. E., and Bonjer, K. P., 1990, Moment tensor inversion of small earthquakes in southwestern Germany for the fault plane solution: Geophysical Journal International, 101, 133–146. Engdahl, E. R., Jackson, J. A., Myers, S. C., Bergman, E. A., and Priestley, K., 2006, Relocation and assessment of seismicity in the Iran region: Geophysical Journal International, 167(2), 761-778. Guest, B., Axen, G. J., Lam, P. S., and Hassanzadeh, J., 2006, Late Cenozoic shortening in the west central Alborz mountains, northern Iran, by combined conjugate strike-slip and thin-skinned deformation: Geosphere, 2(1), 35–52. Guest, B., Horton, B. K., Axen, G. J., Hassanzadeh, J., and McIntosh, W. C., 2007, Middle to late Cenozoic basin evolution in the western Alborz Mountains: Implications for the onset of collisional deformation in northern Iran: Tectonics, 26(6), [TC6011]. Hardebeck, J. L., and Hauksson, E., 2001, Crustal stress field in southern California and its implications for fault mechanics: Geophysical Journal Research, 106(B10), 21,859–21,882. Hardebeck, J. L., and Shearer, P. M., 2002, A new method for determining first-motion focal mechanisms: Bulletin of the Seismological Society of America, 92, 2264–2276. Hardebeck, J. L., and Shearer, P. M., 2003, Using S/P amplitude ratios to constrain the focal mechanisms of small earthquakes: Bulletin of the Seismological Society of America, 93, 2434–2444. Heidari, R., Shomali, Z. H., and Ghayamghamian, M. R., 2013, Magnitude-scaling relationships using period parameters τc and τpmax, for Tehran region, Iran: Geophysical Journal International, 192(1), 275–284. Jackson, J., Priestley, K., Allen, M., and Berberian, M., 2002, Active tectonics of the South Caspian Basin: Geophysical Journal International, 148(2), 214–245. Julian, B. R., and Foulger, G. R., 1996, Earthquake mechanisms from linear-programming inversion of seismic-wave amplitude ratios: Bulletin of the Seismological Society of America, 86(4), 972–980. Kilb, D., and Hardebeck, J. L., 2006, Fault parameter constraints using relocated earthquakes: Validation of first motion focal mechanism data: Bulletin of the Seismological Society of America, 96, 1140–1158. Kisslinger, C., 1980, Evaluation of Sto Pamplitude ratios for determining focal mechanisms from regional network observations: Bulletin of the Seismological Society of America,70(4), 999–1014. Lomax, A., and Curtis, A., 2001, Fast, probabilistic earthquake location in 3-D models using oct-tree importance sampling: Geophysical Research Abstracts, 955(3), 101-134. Lomax, A., Virieux, J., Volant, P., and Berge, C., 2000, Probabilistic earthquake location in 3D and layered models: Introduction of a Metropolis-Gibbs method and comparison with linear locations, in Advances in Seismic Event Location, Thurber, C. H., and Rabinowitz, N., (eds. ), Kluwer, Amsterdam, 101-134. Maleki, V., Shomali, Z. H., Hatami, M., Pakzad, M. and Lomax, A., 2013, Earthquake relocation in the Central Alborz region of Iran using a non-linear probabilistic method: Journal of Seismology, 17(2), 615-628. Mckenzie, D. P., 1972, Active tectonics of the Mediterranean region: Geophysical Journal international, 30(2), 109-185. Nakamura, A., Horiuchi, S., and Hasegawa, A., 1999, Joint focal mechanism determination with source–region station corrections using short-period body-wave amplitude data: Bulletin of the Seismological Society of America, 89(2), 373–383. Natale, G. D., Ferraro, A., and Virieux, J., 1991, A probability method for local earthquake focal mechanisms: Geophysical Research Letters,18(4), 613–616. Priestley, K., Baker, C., and Jackson, J., 1994, Implications of earthquake focal mechanism data for the active tectonics of the South Caspian Basin and surrounding regions: Geophysical Journal International, 118(1), 111-141. Rau, R. J., Wu, F. T., and Shin, T. C., 1996, Regional network focal mechanism determination using 3D velocity model and SH/Pamplitude ratio: Bulletin of the Seismological Society of America,86(5), 1270–1283. Reasenberg, P., and Oppenheimer, D., 1985, FPFIT, FPPLOT and FPPAGE: FORTRAN computer programs for calculating and displaying earthquake fault-plane solutions: U.S. Geological Survey Open-File Report, 109, 85-730. Ritz, J. F., Nazari, H., Salamati, R., Shafeii, A., Solaymani, S., and Vernant, P., 2006, Active transtension inside Central Alborz: A new insight into the Northern Iran–Southern Caspian geodynamics: Geology, 34, 477–480. Schwartz, S. Y., 1995, Source parameters of aftershocks of the 1991 Costa Rica and 1992 Cape Mendocino, California, earthquakes from inversion of local amplitude ratios and broad band waveforms: Bulletin of the Seismological Society of America, 85(6), 1560–1575. Sengor, A. M. C., 1990, A new model for the late Palaeozoic–Mesozoictectonic evolution of Iran and implications for Oman: Geological Society, London, Special Publications, 49(1), 797-831. Sengor, A. M. C., Kidd, W. S. F., 1979, Post-collisional tectonics of the Turkish–Iranian plateau and a comparison with Tibet: Tectonophysics, 55(3), 361-376. Shearer, P. M., 1998, Evidence from a cluster of small earthquakes for a fault at 18 km depth beneath Oak Ridge, southern California: Bulletin of the Seismological Society of America, 88, 1327–1336. Shen, Y., Forsyth, D. W., Conder, J., and Dorman, L. M., 1997, Investigation of microearthquake activity following an intraplate teleseismic swarm on the west flank of the southern East Pacific Rise: Journal of Geophysical Research, 102(B1), 459–475. Stocklin, J., 1974, Northern Iran: Alborz Mountains: Geological Society, London, Special Publications, 4(1), 213–234. Tan, Y., and Helmberger, D. V., 2007, A new method for determining small earthquake source parameters using short-period P waves: Bulletin of the Seismological Society of America, 97, 1176–1195. Tan, Y., Zhu, L., Helmberger, D. V., and Saikia, C. K., 2006, Locating and modeling regional earthquakes with two stations: Geophysical Journal Research, 111,B01306. Tatar, M., Jackson, J., Hatzfeld, D., and Bergman, E., 2007, The 28 May 2004 Baladeh earthquake (Mw 6.2) in the Alborz, Iran: Implications for the geology of the South Caspian and for the seismic hazard of Tehran: Geophysical Journal International, 170(1), 249–261. Yang, W., Hauksson, E., Shearer, P. M., 2012, Computing a large refined catalog of focal mechanisms for Southern California (1981–2010): Temporal stability of the style of faulting: Bulletin of the Seismological Society of America, 102(3), 1179-1194. Zhu, L., and Helmberger, D. V., 1996, Advancement in source estimation techniques using broadband regional seismograms: Bulletin of the Seismological Society of America, 86, 1634–1641.